The ongoing joke in the world of physics is that commercially viable fusion energy has been just on the horizon — 30 years away at most — for the past eight decades. Now, a new Washington-based startup, Agni Energy Inc., has a plan for a fusion reactor the company said could be closer than "just on the horizon." Existing nuclear reactors use a process called fission, which releases energy by breaking atoms apart. But fission creates radioactive byproducts that must be collected and stored. Fusion, the opposite of fission, means joining things together — in this case, atoms. Fusion reactors slam atoms together and thereby release energy. But scientists haven't yet been able to create a useful fusion reactor — one that creates more energy than is put in. If scientists ever reach "the horizon" of fusion energy, these reactors would create a whole lot more energy than fission, without the harmful byproducts. After all, this process is what powers the sun. But both methods are riddled with problems. 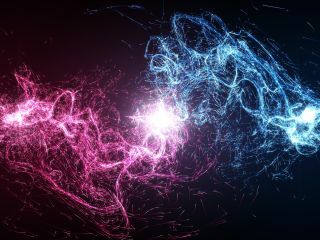 Beams require feeding a whole lot of energy into the system, said Demitri Hopkins, chief scientific officer of Agni Energy Inc. With magnets, if you energize plasma, you may not keep the atoms stable enough to contain all the energy. The new approach would use both electrical and magnetic fields to create a hybrid fusion device. This so-called "beam-target fusion" doesn't try to fuse the atoms from one source; rather, it hits a beam of atoms against a solid target — and the atoms from the beam fuse with the atoms from the target. The ion beam in this approach consists of deuterium, or heavy hydrogen ions with one neutron, and the target consists of tritium ions, a heavy hydrogen with two neutrons. The approach uses hydrogen, which is the lightest element, because in fusion, the lightest elements produce the most energy, according to Hopkins. Magnetic lenses stabilize and excite the atoms in the ion beam, and when the beam hits the target, the two types of hydrogen atoms merge and release high-energy neutrons that can then be used to heat water or power steam turbines. The fusion also creates nontoxic helium and a little bit of the original fuel source, tritium, which is slightly radioactive but can be reused as fuel, Hopkins said. This beam-to-target fusion idea was first proposed in the 1930s and was "thought to be unviable," because it uses more energy than it generates, Hopkins said. "This was originally discarded as a path to fusion energy because it radiates out a lot of energy [that's not usable]. It scatters too much when it hits the target," Hopkins told Live Science. "Too much energy is lost that way, and that was sort of the end of the [idea]." Hopkins and fellow high school students, Forrest Betton and Eric Thomas, engineered a small desktop model back in 2011 and found that spin polarization increased energy efficiency by two orders of magnitude. However, not everyone is convinced this scheme will scale beyond that desktop model. "While such systems can make a low level of fusion reactions … obtaining more energy out than what you're putting in is hopeless for pretty fundamental reasons," Donald Spong, a plasma physicist working on fusion reactions at Oak Ridge National Laboratory in Tennessee, told Live Science in an email. That's because the scattering will likely be too high, said Spong, who is not involved in Agni's research. Even if exotic states of spin polarization reduced scattering, "one would have to evaluate whether the energy required to produce the so-called exotic state would be overcome by the claimed increase in reaction efficiency," Spong said. John Foster, a nuclear physicist at the University of Michigan who is not part of the project, doesn't think it's impossible but just very tricky. "I can't say never, just that it's challenging," he said. "With solid targets, scattering is significant." However, "it is established that spin polarizing does enhance the efficiency greatly," he said. "The trick is pulling it off in practice and en masse." Hopkins said he is optimistic that Agni's design won't take as long as 30 years. "People have been saying they're close to fusion for the last 80 years," Hopkins said. "Eventually, someone's going to crack it." It'll be exciting to see which ship, if any, will find the horizon first. Editor's Note: This story was updated to correct the method of converting fusion energy into usable energy. Fusion can power a steam turbine, not a wind turbine.